Penang and Kedah must sit down and work out an agreement that’s mutually beneficial to both states and their people. IT is interesting to read Penang Chief Minister Lim Guan Eng’s statement that Kedah’s proposal to charge Penang for raw water was “unreasonable” and akin to “asking money for nothing” (“Penang not getting raw water from Kedah”, The Star, June 17). It is equally interesting to read Kedah Mentri Besar Datuk Mukhriz Mahathir’s response that both state governments should negotiate the raw water payment issue. But this is not a new issue. The previous PAS-led government too had made a similar request. To understand the issue, it is good to look at the diagram. 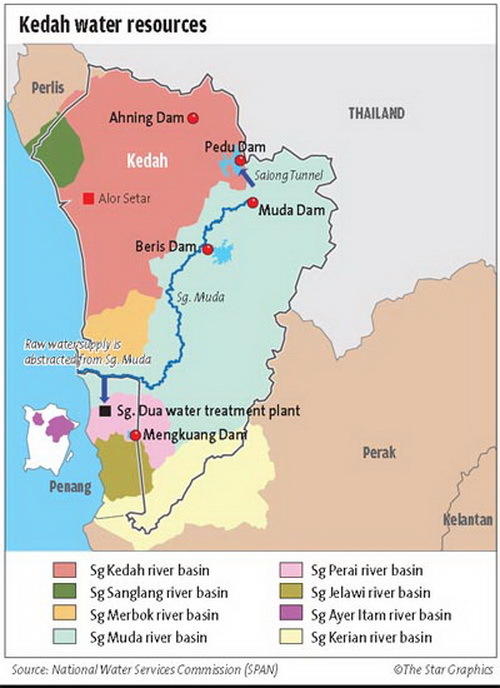 Basically, there are three major river basins in Kedah – Kedah River, Muda River and Merbok River. The Muda River basin is the largest in Kedah covering a total area of about 4,150 sq km. (A river basin is an area of land drained by a river and its tributaries.) There are two dams in this basin – Muda dam and Beris dam. The Beris dam is located at Muda’s River’s tributary, Beris River. The Muda dam is located upstream of the Muda River covering an area of about 985 sq km. When necessary, the Muda and Pedu dams complement each other via the 6.6km Saiong tunnel. The Pedu and Muda dams are located together with the Ahning dam in the Ulu Muda forest reserve, which includes the water catchment area – the size of which is larger than Penang state. In 2003, a Barisan Nasional-led government had planned to log thousands of hectares of forest in this sprawling catchment area. In June 2008, Kedah Mentri Besar Datuk Seri Azizan Abdul Razak had also threatened to fell trees near this catchment area unless the Federal Government paid RM100mil to the Kedah Government. Fortunately, no major logging took place, otherwise silt from logging would not only pollute rivers but also clog up dams and water treatment plants. Large-scale cutting down of trees too would increase the salinity level, causing the water in the reservoirs to turn salty. Hence, whatever happens to this area will adversely affect the lives of the people of Kedah and Penang. The reservoirs here irrigate our country’s main rice bowl and supply most of the water to the two states. Muda River, which is about 180km long, flows out to the Straits of Malacca. Its estuary is located in both Kedah and Penang because since the 1970s, their border has been moved to the centre of the river. 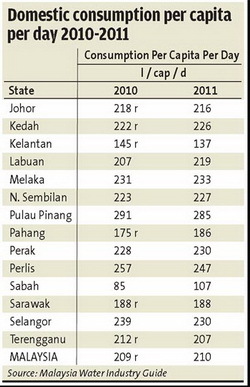 So, in simple terms, Penang is the downstream state and Kedah is the upstream state. In the normal course of events, the downstream state can exact damage to the upstream state only in one situation, when it builds, for example, a dam or barrage which causes flooding to the areas in the upstream state. On the other hand, the actions of the upstream state can, in many ways, affect the interest of the downstream state in terms of quantity and quality of water that flows downstream. In the case of Penang, raw water is extracted from the Muda River by way of pumping it at the Lahar Tiang Pumping Station into a 14km canal which flows either into the Mengkuang dam (funded by the federal government) for storage or directly to the Sungai Dua treatment plant. In 2012, Penang produced about 964 million litres a day (MLD) of treated water. Of this, about 797 MLD or 83% of it came from the raw water extracted from the Muda River. According to the 2012 annual report (page 138, note 19) of PBA Holdings Bhd (“PBAHB”) published on its website, the PBAHB Group, which includes Perbadanan Bekalan Air Pulau Pinang Sdn Bhd, had paid raw water intake charges of RM10.899mil for 2011 and RM8.095mil for 2012. However, none of these payments went to the Kedah government. With respect to Lim, this is perhaps a selfish way of looking at things. Fortunately, this statement was not made during a severe drought season when without sufficient water being released from the Muda dam, the taps in Penang would certainly run dry. In actual fact, water has to be released from the Muda dam whenever the water level in Muda River is low. This happened during the drought seasons of 1998 and 2002. Riparian rights only grant the riparian state reasonable use of the water, but Penang Island, which is the main beneficiary of the raw water from the Muda River, is not located next to the Muda River. So, is that “reasonable use”? On the lighter side, Penang only owns half of the Muda river as the border is in the middle of the river. Is Penang not drawing Kedah’s water too since waters of Kedah and Penang at the border have actually mixed? Penang ought to look at the bigger picture: that whatever happens to the Ulu Muda forest reserve and Muda River basin, which are our country’s major ecosystems, will also affect them. Of course, there is a cost to Kedah to preserve and maintain these water resources by always taking into account the interest of Penang. They could easily promote, develop or economise them for other purposes. Seriously, both states must recognise that there is a value in raw water and accept the reality that raw water is not going to get more in the future. Instead, there will be more depletion of raw water in the future. It is therefore in the interest of both states to preserve these ecosystems and water resources to ensure sufficient quantity of water as well as to protect water quality. It is not just the sole responsibility of Kedah alone. For the sake of future generations, it is actually good if both states can reach an amicable settlement, bearing in mind always that it is in their mutual interest to do so. They should work for a win-win deal. As the saying goes, one should not wait till the well is dry before realising the worth of water. With a regulated agreement, there should also be contractual obligations on the part of Kedah to supply sufficient raw water to Penang. Otherwise, Penang can always be held to ransom one day without legal recourse. After all, it is not that Penang cannot afford it. 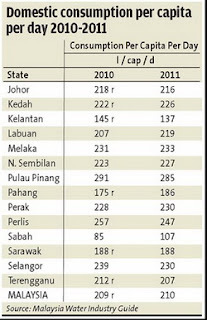 In fact, the water rates in Penang are the lowest in Malaysia where the first 20 cubic metres is only 22 sen compared with 57 sen in Selangor and 60 sen in Johor. 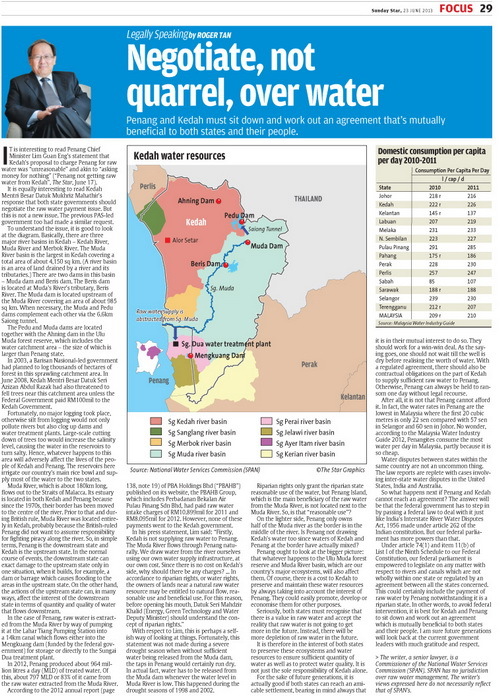 No wonder, according to the Malaysia Water Industry Guide 2012, Penangites consume the most water per day in Malaysia, partly because it is so cheap. Water disputes between states within the same country are not an uncommon thing. The law reports are replete with cases involving inter-state water disputes in the United States, India and Australia. So what happens next if Penang and Kedah cannot reach an agreement? The answer will be that the federal government has to step in by passing a federal law to deal with it just like India’s Interstate River Water Disputes Act, 1956 made under article 262 of the Indian constitution. But our federal parliament has more powers than that. Under article 74(1) and item 11(b) of List I of the Ninth Schedule to our Federal Constitution, our federal parliament is empowered to legislate on any matter with respect to rivers and canals which are not wholly within one state or regulated by an agreement between all the states concerned. This could certainly include the payment of raw water by Penang notwithstanding it is a riparian state. In other words, to avoid federal intervention, it is best for Kedah and Penang to sit down and work out an agreement which is mutually beneficial to both states and their people. I am sure future generations will look back at the current government leaders with much gratitude and respect. > The writer, a senior lawyer, is a Commissioner of the National Water Services Commission (SPAN). SPAN has no jurisdiction over raw water management. The writer’s views expressed here do not necessarily reflect that of SPAN’s.